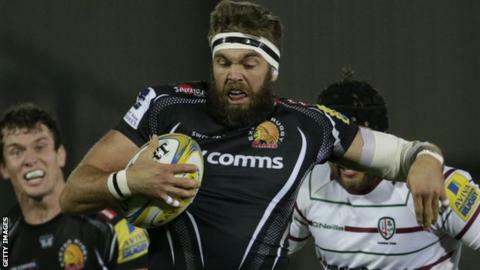 Exeter head coach Rob Baxter says he takes some of the blame for Geoff Parling's groin injury. The England second row lasted just four minutes of his debut and could be out of action for a month. "Possibly it's been a bit of an error on my part to not drip him into training a bit slower," said Baxter. "Geoff was very keen to get on, we were keen to get him involved and there was a change-up in training from what he would have been used to." Former Leicester forward Parling joined the Chiefs after the World Cup and came on as a second-half replacement in the win over London Irish, but now faces a spell on the sidelines. "It's not one that's going to just disappear immediately," Baxter said of Parling's injury. "We're hopeful it's not too bad, the scans don't show anything too major. It could be a week, it could be four weeks, but what we'll do is we'll make sure we get him back when he's nice and comfortable." Exeter train from Monday to Wednesday, while England and Leicester tend to have Wednesday off and return on Thursday. "Whether there was a slight change-up there and he got a little bit stiff and little bit sore, he'd done a lot during the week because he was featuring on the bench and he wanted to do well, who knows. "Was that part of it or was he particularly unlucky? You can never really tell," Baxter told BBC Sport. "We don't see it being an issue, it's just unfortunate that he's not going to be available immediately. "But the plus point is we're able to build in some time off for him now that we would have had to have given him later on to freshen him up anyway, so he's going to get a bit of time away."